Went to see the 1936 adaptation of Wells' Things to Come at Tate Modern this afternoon. 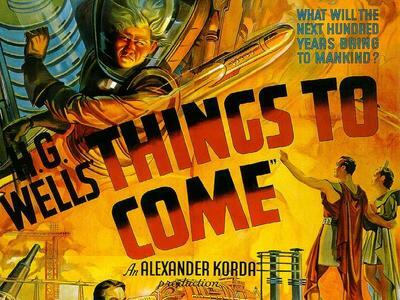 Wells evidently saw Things to Come as the modernist antidote to Metropolis' anti-science dystopia. It comes off as a hymn to Progress in which humanity's saviours are a masonic co-operative of scientists, mechnanics and engineers; their enlightened rationality will deliver humanity from the brigands and warlords who thrive upon conflict. Parts of the film were very much on the ruinationalist theme: Wells' vision of a thirty year war starting in 1940 included a Blitz-like destruction of Everytown (London). The sets - especially the war-gutted city and the reconstructed metropolis of 2036 - were astonishing feats of design. Question: why is this inspiring whereas today's cinematic giganticism is so depressing and flat? I think, it's because today's digital blockbusters are solely about Spectacle as opposed to Vision. Wells' vision was no doubt troubling and flawed, but it gave the film something for which no amount of pixel-crunching can substitute. there's a picture of Dores called the new zealander which depicts a new zealander sitting on a knoll sketching the ruined london which lies before him. I'm repeating myself from previous posts here, but I've come to the conclusion that the trouble with (most) digitally creations is that, because they come so nearly close to being real, the remaining tiny gap becomes inordinately noticeable - so no matter how much physics calculation they put into it, the creatures always seem unconvincing, weightless and fake, the buildings and machines look too clean; it's actually easier for us to accept and enjoy something that in some sense we 'know' is fake and theatrical than something that presumes to be totally realistic. No doubt there's a good diagonal to be searched out (no one wants to return to Jason and the Argonauts! ), but I think its this naive conception of realism (or the naive assumption that realism is what's reuired) that's at fault.